picked up this planter for $500 from a dairy farmer who closed his place. It's a john deere model 7000 planter. Here I've got Garret and Sean working on it. 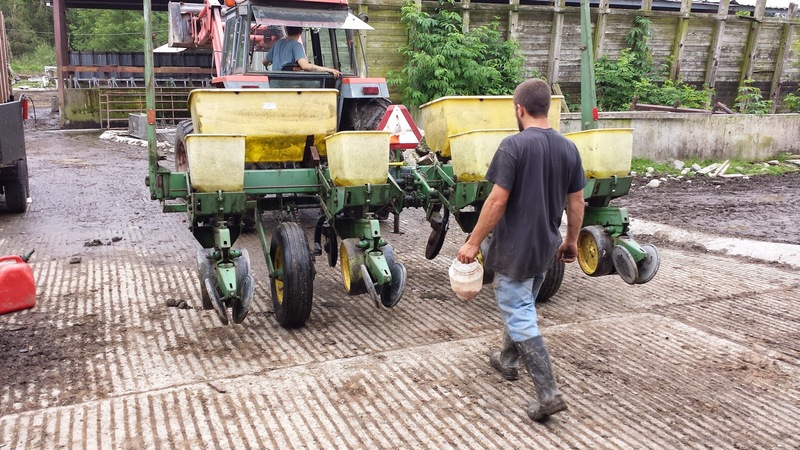 Seed is expensive, so what's going on is that we're putting a little bit of seed into the planter and making sure that it's being delivered at the spacing that we want, and that all of the parts work. This isn't the latest-and-greatest planter; but it's mostly functional. Pressure wash it to get the grime off of it for easier inspection. Grease for all the parts that spin, chain inspection, replace a couple of belts for $12.50 each and order a couple of bin lids (I'm guessing they blew off at some point ) and then put a little bit of feed into it, and roll it back and forth on the concrete pad, watching the seeds fall. Seed corn sells for $4/lb, and if this thing doesn't work correctly it'll waste hundreds of dollars, so this is actually a pretty important activity. Worth spending half a day to get it right. I notice that the corn meters (the part that actually grabs each seed) isn't as accurate as it could be. So off to the manual I go for the cleaning and tuning instructions. The bins are fiberglass, and I'm getting itchy working around them. I make a note that I need to paint them to keep the fibres in place, and I'll probably need to replace one of them. I keep a list of maintenance for each piece of equipment, and that's a rainy day activity. I'll order the parts so that I can do the repair as time allows. This particular planter is set up for dry fertilizer (the two larger bins on the tractor side). I'll skip that for now; I've put lots of manure tea from the manure lagoon on the land I'm planting, and I think it'll be good for this planting. This JD 7000 can plant beans (soybean and edible), corn, probably pumpkin (although it's not listed, the seeds are the right size and shape and a lot of people are still using it. More modern variants of seeders can be amazingly large. 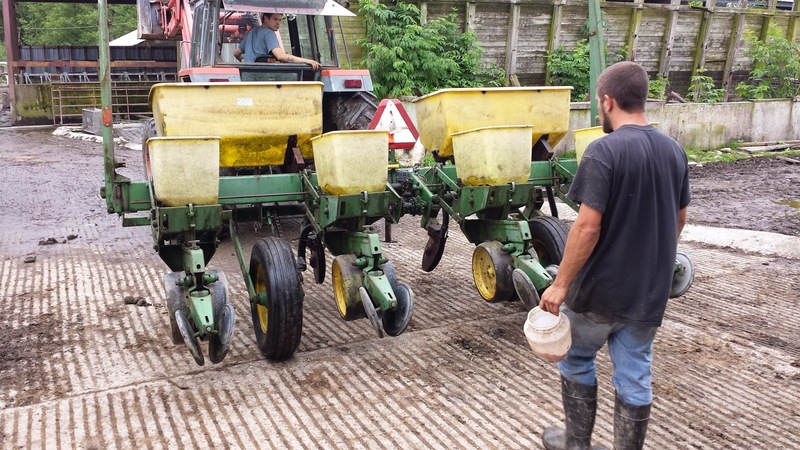 It's the same basic unit; each row gets its own planter, there's just quite a few more rows. With that sort of setup you can plant an acre in a few minutes, and they do. 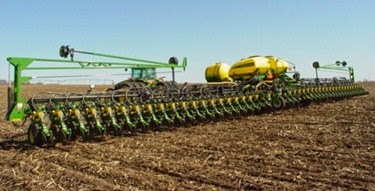 With a four-row planter you're probably talking about 30 minutes per acre at roughly 30,000 corn plants per acre population. 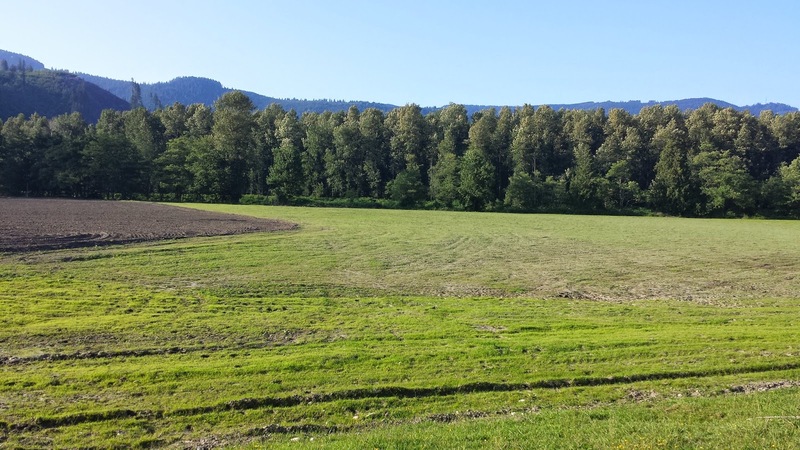 On the pasture front, I'm pretty happy with the growth of the various plots of grass and alfalfa. 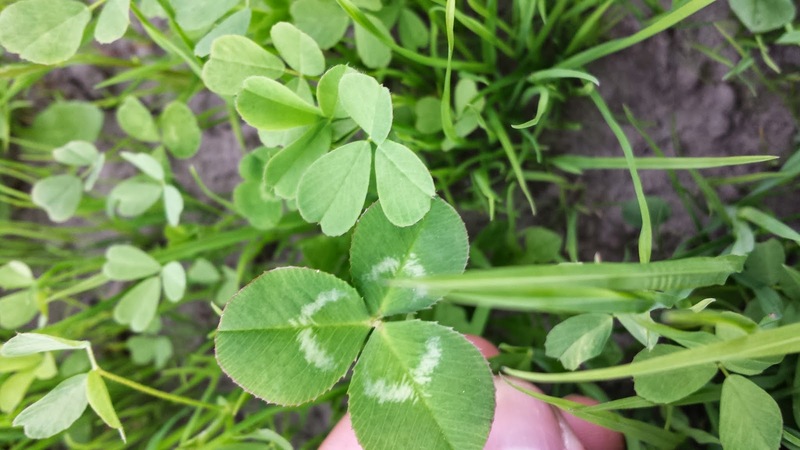 In the picture above I've got some clover that I'm holding to compare to the alfalfa, and you can see the grass nurse crop. It's greening up well. 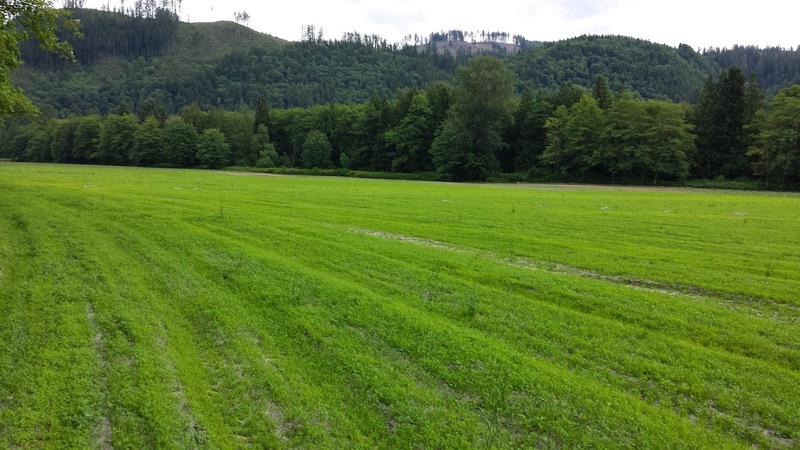 The grass/alfalfa mix is much greener than the 100% alfalfa, but I'm sure that it'll fill in over time. The forage is about 3" tall at this point; it'll grow quickly from here. And the dogs love running in it and rolling in it. I've been raising a batch of dairy heifers under the advice of the local dairymen i've talked to; starting with young calves, bottle feeding them and then weaning them onto grass. 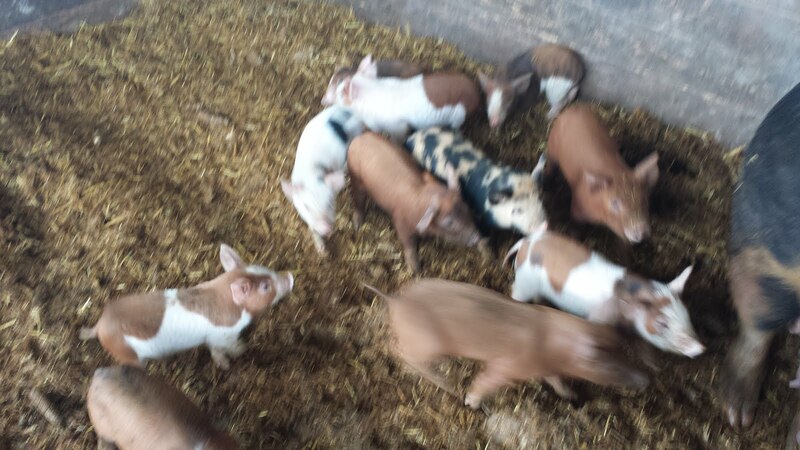 Things went pretty well; twice daily feedings and the weaning process, and this batch of 10 progressing nicely. Well, all but one. A little jersey heifer never really did very well. I made sure she was bedded well and had food and water, but she lost weight and didn't look good; I wormed her and considered calling a vet, but for the cost of the vet visit I could buy another heifer, and so economics won. She finally stopped eating and died. The other 9 were doing ok, so while it's a small setback, it's not really unexpected. Sometimes you lose one despite your best efforts. Of the other 9, one was a little bull calf, and was a little behind the others in development, but the other 8 were fine and in due time I moved them to a summer pasture. The property is fully fenced, but it's got a ditch that runs across the eastern edge, and it's difficult for me to say that I lost 3 of the little heifers into that ditch, near as I can tell the day we moved them there. They were young cows, and the grass was long. I got a count of the cows we'd moved from the guy who transported them, and I went down every day and counted them... only to figure out that the count was 3 short. That took three days, and so I went down to see if I could find them, and sure enough, I found all three, dead in the ditch. This is the hardest sort of loss; there's time, and money, and I am just kicking myself that I didn't fence that ditch off or something. So I started with 10, and then I was down to 7, and today my count came up short; another little heifer is gone. She's only a couple of hundred pounds, and and she's not anywhere I can find. I'm wondering if she got stolen. 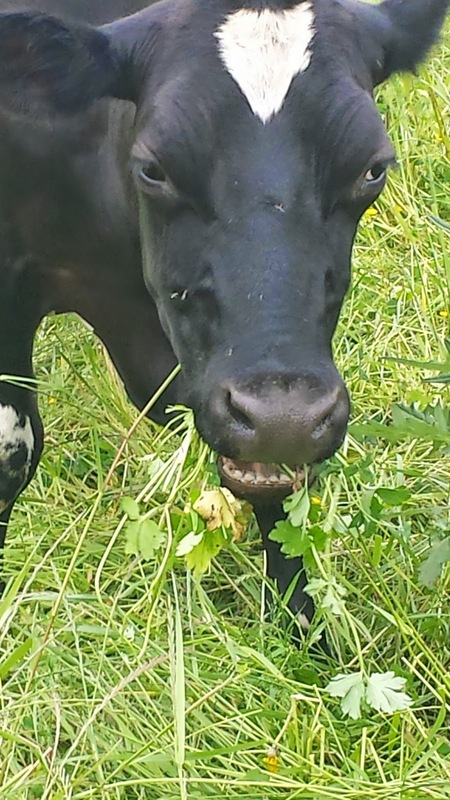 She'd be the easiest cow to steal -- small, bottle-friendly, trusting -- but I have to say that the move to greener pastures this year has been a disaster. Not the way I'd like it to have gone at all. Here's a situation where the mobile welder would come in handy. If you look in the picture above, you'll see the tripod that is part of the hose reel. you grab this and unwind the hose; the water cannon is on top of it. The problem is that the water isn't coming out of it. you can see a small stream of water coming out of the line, but none out of the cannon, and certainly not at any kind of pressure, which is odd. I'm thinking that there's a blockage in the line somewhere. So now I'm trying to figure out how to clear something out of the 1000' of hose, but first I might as well fix the pipe. At first I thought it was the gasket between two pipes, but nope, it's the pipe itself, rusted through. It turns out that the hose reel has enough length that I can just detach the hose, and drag it all the way back to the welder in the shop. Weld it up, and then drag it all the way back. Takes about an hour, and I'm back where I started. I didn't get the welding done until dark. In the morning I'll pull the remaining hose off the reel and shake it a bit and see if I can't break loose whatever is inside of it, apply some pressure and hope for the best. Here's a picture of the full irrigation setup. The tractor powering the pump is at the left, in the distance. It's about 2000' from the tripod. The hose reel is in the center, and is orange. What I'd like to do is water the squash patch before the seeds germinate; both to fertilize them and to get rid of the water in the manure lagoon. Kinda kill two birds with one stone. But this blockage mystery is making that hard. For the kind of farming that i have been doing, mostly pigs, i've needed to have a way to deal with tons of food. most of that I did with a tractor, first a david brown 995, a pretty good 2wd tractor with a loader, and later with a kubota 9580, and then later still with a kubota m125x. the tractors have gotten bigger, and that worked for the initial operation, but at this point i've got a whole new set of implements, and i really don't want to spend much on them, and that means welding. 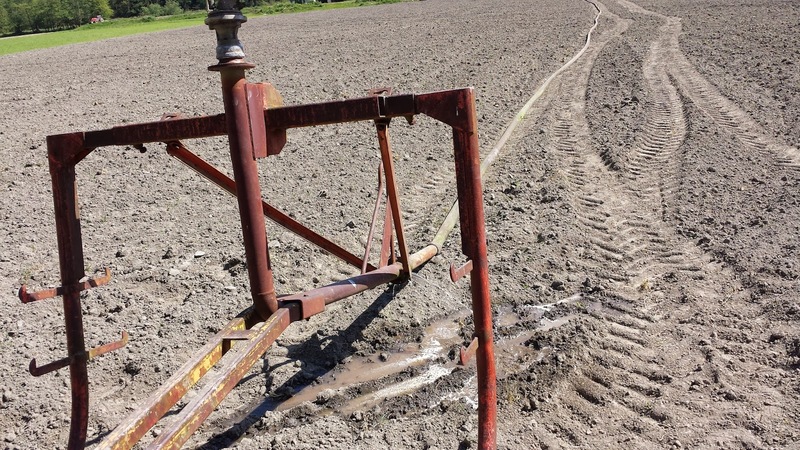 with the hose reel, which is what it sounds like -- a giant wheel with hose on it and a system to wind it back on the reel -- what i had to do was do an inventory of the stuff that i inherited with the farm. i found 1000' of hose in two 500' lengths, with one kind of connector on it, and the hose reel had another. How do you connect the two? Welding. 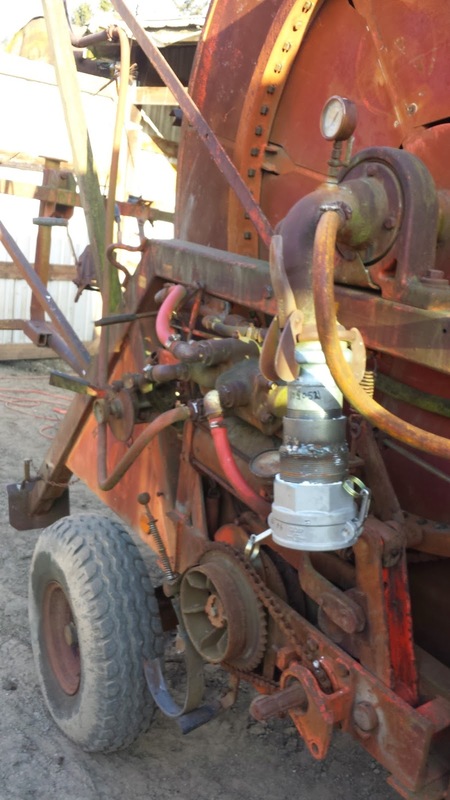 a local farm supply store had the fittings, and i welded the bits together to connect the water/manure supply to the hose reel, and then looked at the other end. the sprayer end is basically a small water cannon, and i found on on craigslist for $250 (they sell for $500 or so new) and picked it up to find out that the mount on the hose reel wasn't the same as the cannon. $8 in pipe parts and 20 minutes of grinding and welding and i screwed the new cannon on the old reel. At this point i have enough equipment and enough activity that there's something to weld, either to fabricate or repair, every few days. 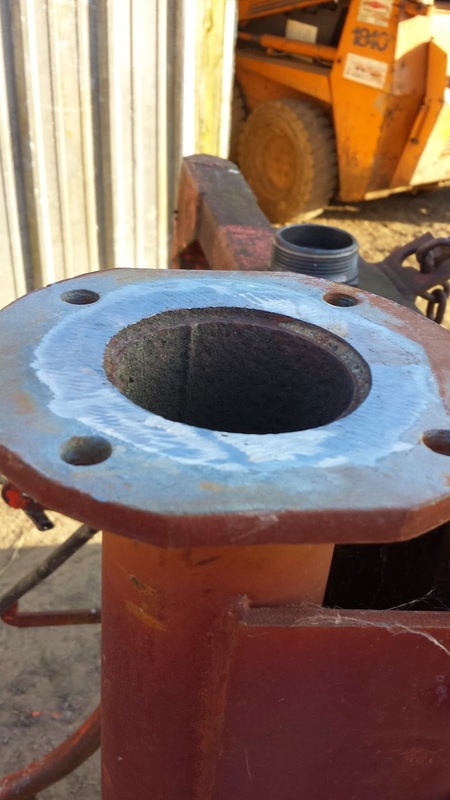 and a welding setup on the farm means that when something does break it's down for a half hour, not several hours or several days waiting for parts, or for a repair shop. my welds at this point aren't very pretty - working on that - but i'm sure that practice will make perfect. I would much rather be farming. Believe me. I had 4000 squash seeds to plant. And I know that there must be a way to do this with a tractor. In fact, there are a lot of different kinds of seeders, different technologies... this is a problem that has been solved millions of times. 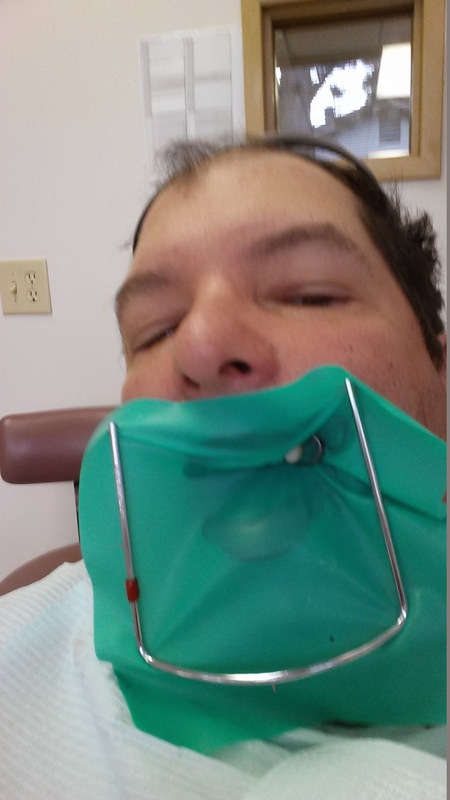 But this is an experiement, and I don't want to own a piece of equipment that I use once in my lifetime. If the experiement doesn't work, I don't be planting this sort of quantity again. And I'm really not planting that big a quantity -- I'm planting rows that are 10' apart, with 3' spacing in the rows. The 10' rows allow me to run an 8' wide cultivator down the center (that i already own) and clean up most of the weeds. If this works out, I'll probably tighten the spacing..., but that's for another time. Right now I've got squash to plant. Thousands of them. So... old school. 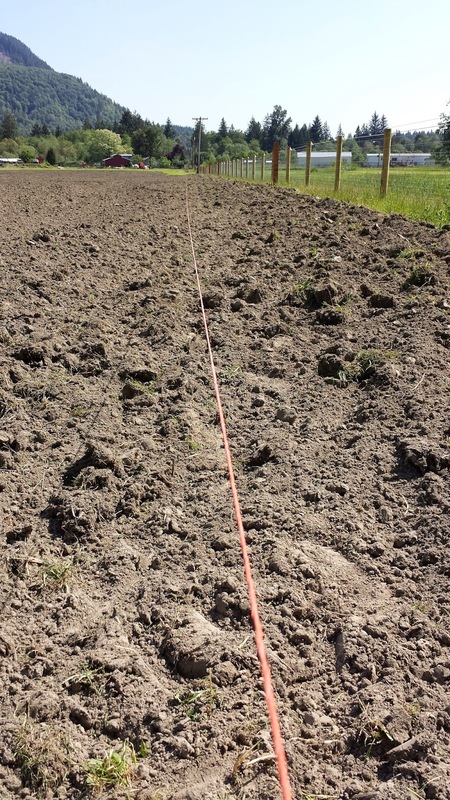 On the soft cultivated ground, I stretch out a long bit of baling twine; maybe 900' of it. I use a push-in fence post at each end, and pull it tight. Straight line. I work with my steps, measuring out what 3' is, and then do a fairly slow shuffle down the row. scuff a depression, drop two or three seeds, cover it with the other foot while taking the next step. A pair of earphones and "wrath of the khans", a history lecture by Dan Carlin, and two hours pass by surprsingly quickly. Each row is about 1000' long. row after row, 10 hours later i'm more than two thirds done, and I'm out of howden pumpkin seeds. So I switch to acorn squash, and then to sugar pumpkins, and finally to a personal patch of sweet corn. Pretty satisfying way to spend a sunny day, shuffling along, planting, learning about the mongol hordes. if I can get a decent crop of squash I'll do what I can to sell them, but the real goal here is to grow a crop that is relatively easy to grow and that the pigs enjoy eating. I'll harvest it with the pigs by turning them out on the squash patch when I've picked all the squash that I can harvest. 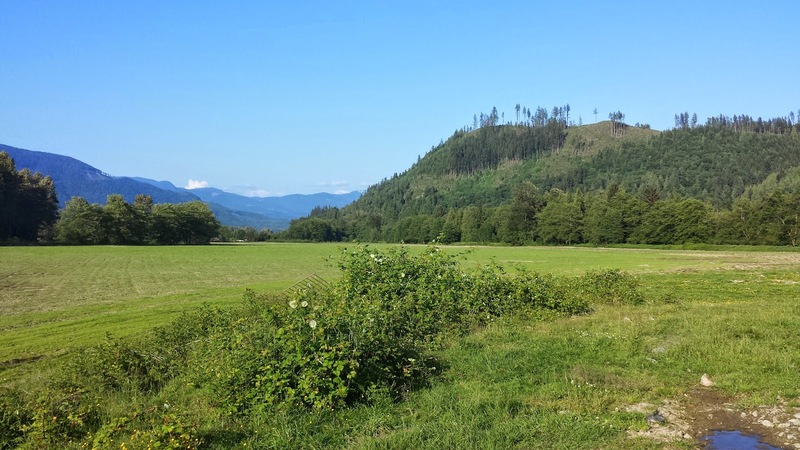 This year i'm working slowly on three long-term projects; the first is planting, growing and harvesting forage crops to feed mostly cows. The second is to raise a group of dairy heifers, 10 of them, to maturity and breed them. The third is to keep my pig operation on track to increase its production by about 50% in the coming 12 months. The forage project has been a mixed result. 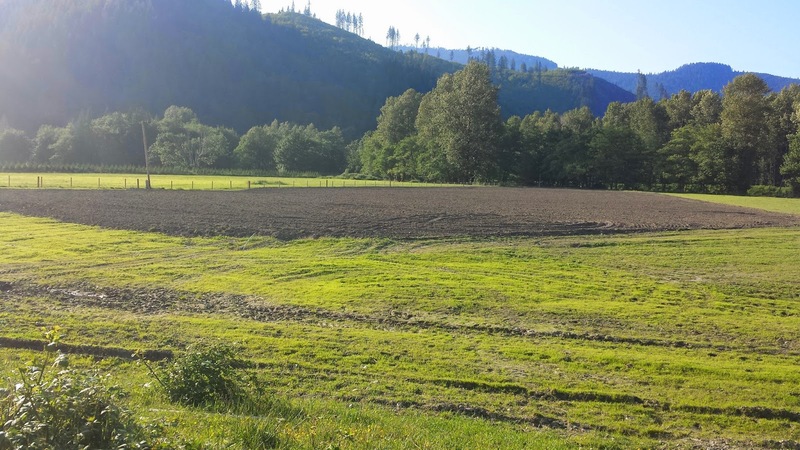 I planted grass and alfalfa last year but considered the entire planting to be a loss. I planted too late in the year, and we had both colder and wetter (a lot wetter) weather to deal with. So I plowed the whole thing under and tried again this spring. 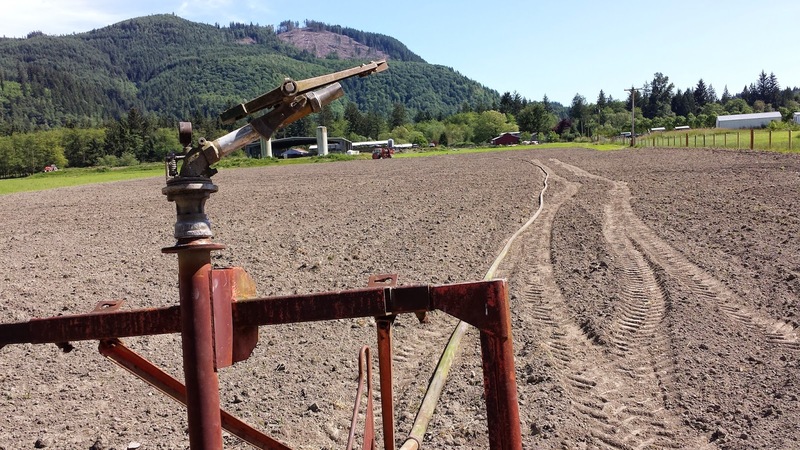 The upside was that i got a lot of time with the tractor and implements; I'd never used an in-ground plow, and there's nothing like time in the saddle. i spent a good two or three weeks working out how to use the implement, and at the end was able to produce smooth straight furrows that disked up well. The downside is that seed is expensive, and alfalfa seed particularly expensive. So the education cost me about $3,000 in seed and about 90 hours of tractor time. plowing, and then three passes with the disk, and then carefully reseeding gave me better results this spring. the true test is how it'll survive the winter. 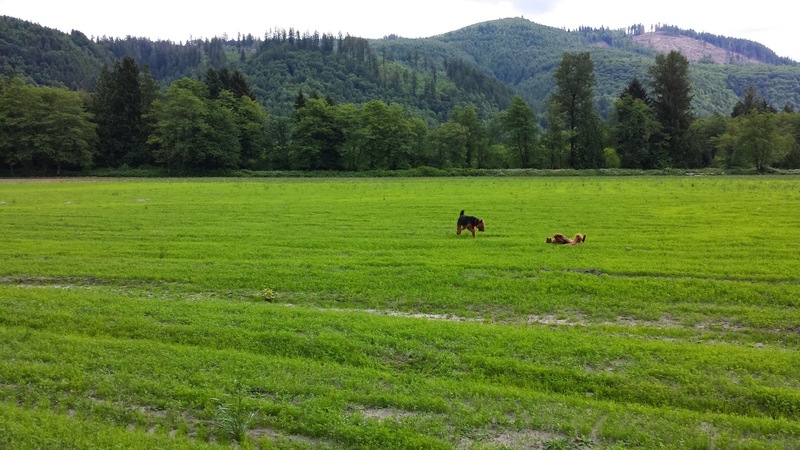 I chose orchard grass as the primary pasture grass, based that on the advice of other farms in the area as to what grew well and was relatively hardy. another 50 acres or so, various test plots out there. So far so good; everything is coming up well, and we've had enough rain and enough sunshine. Over the next few days I'll be working on the sprayer systems, so that I can spray the contents of the manure lagoon over the new growth. The manure lagoon is pretty diluted at this point; the water is green, but it's been at least three years since new manure was put into it. I'm stirring up it up for some aerobic digestion. I'll be spraying the squash patch pretty heavily - I've got a couple of days before the plants come up,and I'd like to get as much as I can into the soil before that happens.